It was a visit to a post office after I-don’t-know how many years and the first one to a Mumbai one – Vile Parle (W) to be specific. And now I realize it that it was actually a visit to any government office after a very long time. A visit to such government touch points really strengthens your view that capitalism/privatization is the key for development. It’s a faint memory when I used to buy stamps and inlands to write letters. From the past many years it has been the private courier services. So when my father asked me to send a 1 page document by normal post only (rather than using the ‘costly’ courier), I decided to try the post office once again. 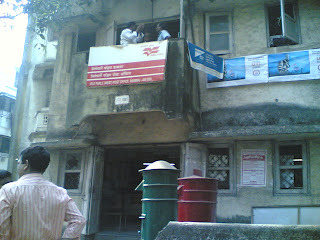 Reached the Post office whose building was in a pathetic condition (evident from the pic above). I asked for stamps from the counter which had “Stamps/Envelopes” written in front of it and was asked to go to another one. There was no one here, so I waited patiently for few minutes. After it was evident that a customer was not even being looked at by the employees, I asked a person standing there to give me the stamps. He again said that a lady was on her way. Again a few minutes wait. And Again I went to that person and requested him that it will take him a minute to give a 5 rupee stamp to me. Rather than giving, he went about calling the lady, asking where she was. I again went back to the counter. Our dude came back and started chit chatting with another lady there. 2 more people joined in. But still no sign of the ‘stamp-lady’. That was it for me. I went back and again asked, first politely and then a bit harshly that if he would give the stamps. “Wo uska kaam hai. Wo degi aa ke. Aap ruko” (its her job. She will give it. Just wait) , he said. It was time and he duly received some niceties from me. He replied, “Isme main kya kar sakta hun” (What can I do in this?). Guess instead if asking me, it would have been better had he asked the question to himself. It is a gargantuan effort to restructure or reform such government bodies. The government has, infact tried to bring the private players down in recent past. Because they themselves know that bringing postal services to the higher level is simply not possible. P.S: Sorry to my blogger friends for not visiting their blogs recently. Things will relax after 17th..
Government offices are planned to keep the Indian population mentally and physically sharp. Physical exercise is given in the interminable lines (note the plural), while the brain is sharpened while figuring out which line to stand in. Still busy ?? Exams aa rahe hain na ? @50cent: i think u r correct... some experiences have made me feel that way too..
@cuckoo: bilkul sahi pehchana.. exams sir pe hain ;) and u hv tried 3..